1.FPC or calls Flexible PCB opens the window to new opportunities for engineer and PCB designers to make a complete transition to the third dimension of interconnection. FPC now also continue to provide the very best and most practical solutions to interconnecting electronic elements that must move relative to each other.it have two important features is motion and three-dimensional interconnection.also with reduction in package size and weight, increased functions, Easy for product design and assembly,enhance the product system reliability and repeatability,enhance cost-effective. 2.Rigid-flex PCB is the circuit boards using a combination of flexible PCB and rigid PCB board technologies in an application, Most of Rigid-Flex PCB consist of multiple layers of flexible circuit substrates attached to one or more rigid boards externally and/or internally, depending upon the design of the application. Rigid-Flex PCB are a key enabling technology for products ranging from simple consumer goods to Military Electronics,They are the key elements in such diverse products as Cell Phones, medical equipment, Electronic Security PCB, keyboards,hard disk drives,printers, And it become more and important for PCB field in the future. 3.Panda PCB insists to provide the best FPC and Rigid-Flex PCB to our customer, If you are looking for a FPC or Rigid-flex PCB supplier, our experts are here to assist you to get the maximum value in your business. With a large number of investment on the facilities of flexible PCB and continuously innovating the flexible PCB manufacture technology, Our FPC Group is able to provide our client with flexible PCB as well as Rigid-flex PCB with a variety of technologies, from single-sided flex PCB to complex multilayer flexible PCB and Rigid-flex PCB with HDI blind and buried design even with Impedance Control PCB. 1.High flexibility, allow 3-dimensional metal wiring assembly and take shape along with the package. 2.Reduction in package size & weight, increased functions,enhance cost-effective. 3.Easy for product design and assembly, enhance the product system reliability and repeatability. 4.Dimensionally stable, excellent chemical resistant. 5.Excellent electrical properties, withstood thermal shock,low in moisture absorption and non-flammable. 6.Fine line/space, Eliminate connectors,enable dynamic flexing and improve aesthetics. 1.Excellent Flexibility: Stable and repeating flexibility is helpful for 3-D electronic products assembly. 2.Lower Toughness: Lower toughness is benefit for standing more thermal stress and reducing the joint cracking risk. 3.Thin dielectric: Thin dielectric could have better flexibility and better heat transfer, those will be benefit for structure design and thermal management. 4.Great high temperature performance: PI material could be operated under high temperature environment then can fit for high temperature applications. 5.Good manufacturability: Some flexible material can use laser or chemical etch create pads or window then could be used in double access applications. 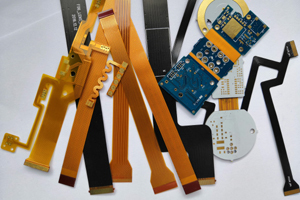 6.Multi-plane connection and size shrinking: Flexible boards could be bended and binding with rigid-flex technology then can reduce connector and terminator using that can reduce weight. 7.High space utilization: Flexible boards can replace many connecting parts and join multi plane boards then by these strength can saving space and make design easier. Base polyimide film thickness: 0.5 mil (12.5u), 1 mil (25u), 2 mils (50u).